The Lakes Division operates over 4500 acres of open space area including the City's two lake facilities, Dixon Lake and Lake Wohlford, and the Daley Ranch open space preserve. The Lakes Division supervises the citywide park ranger program. 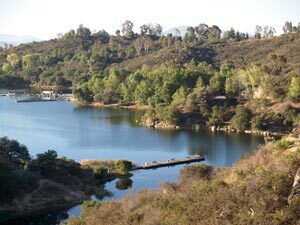 Dixon Lake is located in the northern Escondido hills and offers fishing, camping, boating, hiking and picnicking. Dixon Lake is open year-round. Gates open at 6:00 a.m. daily; park closes at dusk. Night fishing is available during the summer months. Dixon Lake is stocked with trout and catfish annually. Contact Park Ranger at 760-839-4680 for further information. Lake Wohlford is located in northeastern Escondido and offers fishing and boating. Lake Wohlford is open from early December to early September seven days a week, and from early September to early December on Saturdays and Sundays. Fishing hours are 6:00 a.m. to dusk. Lake Wohlford is stocked with trout and catfish annually. Contact Park Ranger at 760-839-4346 for further information. In 1996, a 3,058-acre parcel of San Diego's native ecosystems was purchased and reserved in perpetuity for the enjoyment of visitors to North County. It has become a haven for horseback riders, mountain bikers, hikers and nature lovers. A visit to Daley Ranch offers the scent of California sagebrush, the call of a brown towhee, and the majesty of San Diego's endangered Engelmann oak woodlands in an atmosphere of tranquility. The City of Escondido Utilities Lakes Division administers Daley Ranch. Daley Ranch Naturalists, the volunteer interpretive program of Utilities Lakes Division, began in 1998. Rangers and supervisors felt it was important to establish a program to interpret Daley Ranch's natural, cultural and historical resources for ranch visitors. It is believed that through understanding the Ranch's ecology and history visitors will gain an appreciation for those resources, and through appreciation they will strive to protect the land. Daley Ranch programs are currently funded out of the Lakes Division's budget. Formal training of 15 Naturalist trainees was started in September with each trainee required to attend a total of 45 hours in workshops conducted Saturday mornings for two months. Experts and specialist instructors volunteered their time to teach in areas of Geography, Geology, Ornithology, Botany, Ethnobotany, Native American History, Wildlife/Tracking, and Daley Ranch History. In addition to resource instruction Naturalists were given park orientation and training on radio use, CPR and first aid procedures.Experts and specialists contributed 36 hours in instruction. In its first year of service, a total of 18 Naturalists were trained, and the program is still going strong.